MYHD (My Hair Dresser) products are made in Italy and are one of the first salon quality hair colours for home use available in New Zealand. Unlike boxed colours you can choose the right developer for your hair colour. MYHD colours can be used as a permanent by choosing a Volume 20, 30 or 40 Developer, or can be used as a semi permanent by using a no lift developer. Why MYHD? Choosing the right hair dye How do the developers work? How to use MYHD as a permanent hair colour? How to use MYHD as a semi permanent hair colour? How to use MYHD Colour Remover? Page updated 29/01/19 4:30:03 a.m. Salon Quality Products at home, at a great price. Permanent Hair Colour feature new colour technology designed to not damage your Hair. 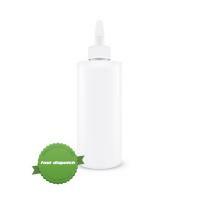 Has one of the lowest ammonia levels on the market. My Hairdresser Permanent Hair Colour and Developer are both resealable, perfect for regrowth! You only mix as much as you need so there is no wastage. The colour remover product breaks the bonds between the dye and the hair rather than stripping all the colour pigment from your hair. 1. Pick the MYHD colour that is closest to your natural hair colour. 2. Pick the colour tube you would like to use to dye your hair. 3. 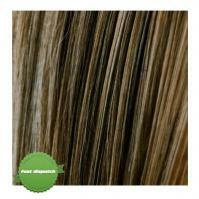 Count the number of levels you need to lighten your hair to get it from your original colour to your new chosen colour. The hair colours are numbered if you are going lighter count the number of levels between your base colour and your chosen colour. 4. Chose a developer based on the number of levels you wish to lighten your hair, or use the no lift developer if you wish to achieve a semi permanent result. How do the developers work? 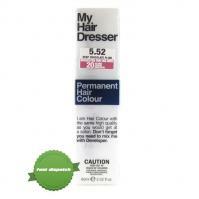 No Lift Developer - Contains no ammonia or bleach so can not lighten your hair. Instead it helps the colour semi permanently bond to your hair, but will wash out in 8 - 12 weeks. Its perfect if you would like to go from light to dark. It also works as a toner for blonde hair. 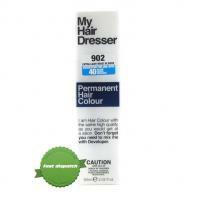 20 Volume Developer - Is a mild developer that lifts the Hair 2 Levels making it ideal for colouring hair that is not too far from your natural colour or if you just want to cover some grey's. 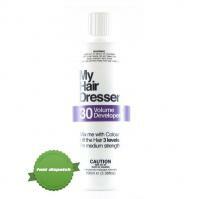 30 Volume Developer - Is middle strength and works by lifting the Hair 3 Levels. If you have naturally dark hair it brings out the best in reds, violets and coppers by lightening the base colour underneath to produce the best vibrancy. 40 Volume Developer - Is the strongest in the range and lifts the Hair 4 Levels. Ideal for bleaching your hair blonde if you are choosing any of the High Lift Blonde series. Great if you have Naturally Dark Hair you wish to lighten. 1. Mix 1 Part My Hairdresser Permanent Hair Colour and 1.5 Parts My Hairdresser Developer in a plastic or glass bowl or shake up in a bottle until a smooth and creamy paste is achieved. 2. 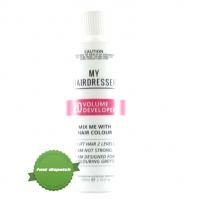 Apply to dry hair starting at the regrowth area, apply the colour carefully and evenly to dry, clean hair. Massage colour through the hair wearing protective gloves to ensure even coverage. 3. Let the colour develop once the colour has been applied to the hair, leave in hair for 35 to 40 minutes. 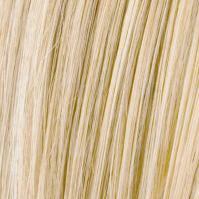 NOTE: For high lift blonde colours We suggest allowing the High Lift series (901, 902 and 908) 45 minutes to develop. 4 Rinse the hair thoroughly for 3 to 5 minutes in warm water until water runs clear. Do not shampoo. Condition Hair as normal. To create a semi permanent result use the no lift developer instead of a 20, 30 or 40 volume and use the same method. 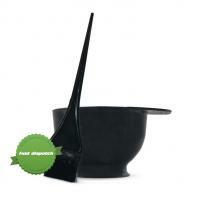 Purchase 1 x Colour Remover 1 x Application tool (bowl brush & gloves or bottle and gloves). 1. Mix equal parts of Part A and Part B in a plastic or glass bowl. 2. 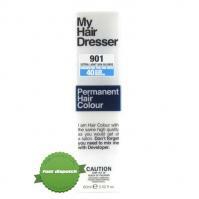 Apply evenly to dry hair as soon as it is mixed as performance decreases with time. Once applied to the hair, leave for 20 minutes to develop. To get the best result, wrap the hair with plastic cling wrap. THINGS TO NOTE: Only apply to areas that contain the unwanted colour. Do not apply to regrowth. If the Colour Remover causes irritation, rinse out immediately and do not continue to use. 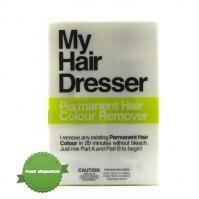 Do not repeat the Colour Remover process more than 2 times in a row. 3. Rinse your hair for 3 to 5 minutes in warm water and shampoo the Hair vigorously 2 to 3 times. If the colour is not completely removed, repeat steps 1 and 2. Tip: We suggest waiting at least 48 hours before recolouring your hair. When recolouring, select a colour at least 2 shades Lighter. Page updated 29/01/19 4:30:03 a.m.